Rednekk Engineering: Stretching the 'Budgie! Stage 2: Laying in the basic panels of styrene. Stage 4: Then... the 'goop'- squadron green putty + testors liquid cement - to fill in the holes,gaps,etc. and to hopefully even out the areas once they are sanded. 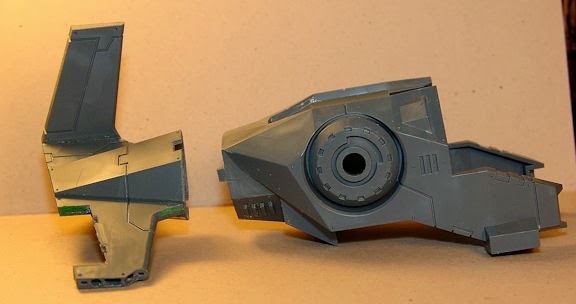 And the next step will be sanding and seeing how it all turns out, then "prettying" it all up afterwards to make it look Imperial. That's all for now. Cheer's ya'll! 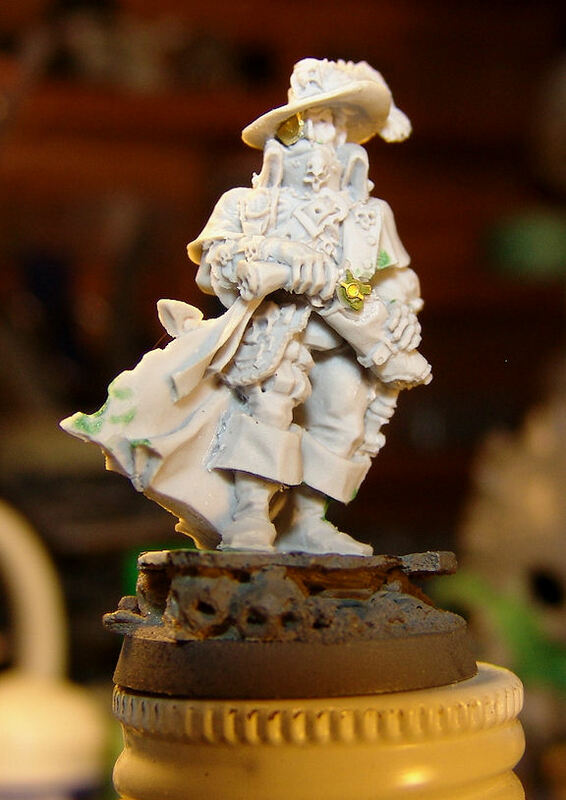 Have I mentioned how much I love, love, LOVE the latest GW washes (shades)? Have I? Well, they are definitely the key to Strike Force Ickarius' makeover. 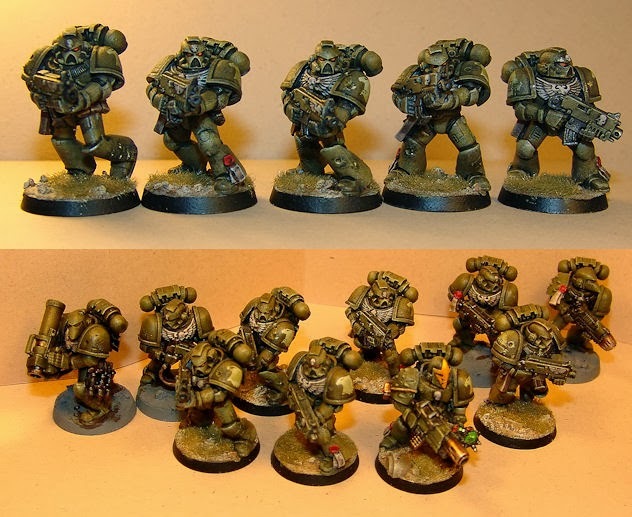 I did some detail painting on some things like chest eagles and such, but for the most part it was all about Athonian Camoshade over the existing olive green scheme, including the white decals, especially for Tactical Squad #2 which I expanded out to its full size. SO... with the exception of a little detailing on the expansion guys for Tac #2, here's the Tactical gang rebooted. Tactical Squad #3 will keep their Razorback... and gained a Meltagun. As you might have noticed, both Sergeants got a "muting" of their ornamental yellows. Back in my days of competitive model building, there were certain kits you only went near if you were brave, suicidal or EXXxxxtremely confident in your abilities. I'm sure those kits still exist in certain categories, but in the days when I built models the one and only decent kit of the German He-219 was the 1/72 scale kit by DML. To build one and enter it in competition was very brave. The kit was a BEAR. To detail it and trick it out was suicidal. The only hope you had of taking home a plaque was a limited number of entries in the category. I built one, with photo-etched antenna, filled all the friggin gaps, unwarped all the warps, filled all the mold issues, rescribed all the panel lines that needed rescribing... you name it. I hit it with my strength, painting and took it to a show thinking I might score 3rd place since there might be 3 planes in the category. There were nearly 20. 20! Somehow, I pulled off 1st place in that category and was actually in the running for best aircraft- probably, because at the time- it was so rare to see at a show. Why did I tell ya'll this story? Not to toot my past horn.... but to to say that after surviving the DML He-219 gap-turkey buzzard and turning it into an award winner, I have never seen as many gaps and fit issues on a model as I have the Budgie. Good GOD. And God help me.... I actually like the fuggly little bugger. The more I build it, the more I like it. I want to buy more of them. Must be all of those concussions. SPEAKING OF GAPS..... a half round, stock plastic can do wonders when you are you doing that little "slight-turn-of-the-rudder" trick ...which usually works better on parked aircraft, but hovering aircraft can work too.... B-BUT WAIT....W-What is that thing next to the rudder? Anyone have a can of Raid on hand? Enough rambling for now. Catch up with Ya'll around Sunday! Cheers Ya'all! From the Workbench: Magpies,Raptors and squishy things. Seems I've lost my mind a bit... again. 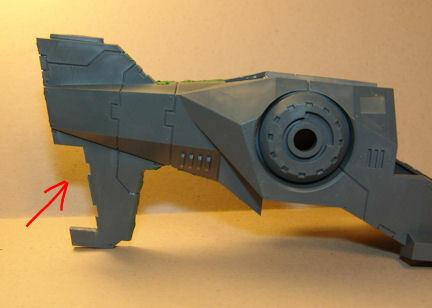 I decided to lengthen the fuselage on the Stormbudgie. A note to anyone else even considering this, cut it BEFORE you glue it together... its a HELL of a lot easier. So, now the plan is to build the inside plasticard, then the outside. That should be in the next post.... I hope. A: Is the newly painted guy, using the new washes - which I absolutely love and didn't have when I did the army the first time. 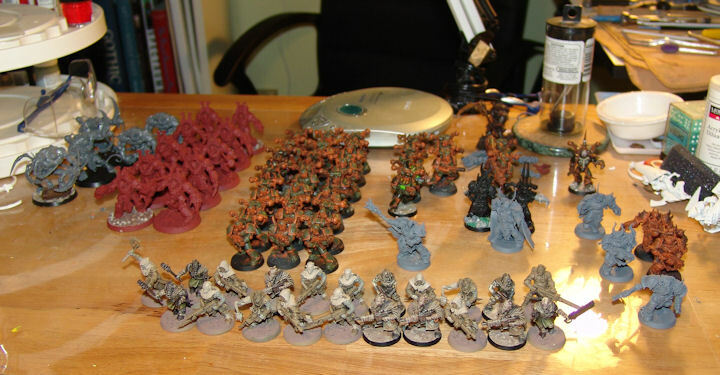 B: One of the old guys with One overall wash of Athonian Camoshade. It dirties up the white. The wash makes the muted olive look abit more green and really helps with the recesses. I'm thinking another wash (or two) might work. C: One of the old guys, untouched. Looks like I may have a plan forming. 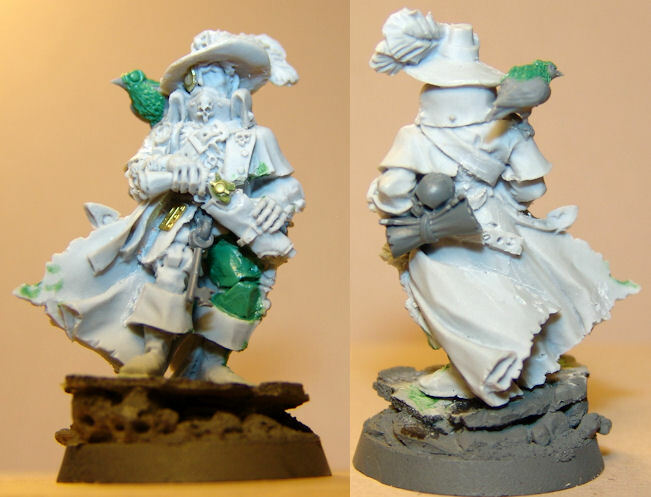 So, now the Inquisitor is ready to be primed. And then paint. "Captain, we could really use a little air support to get the momentum back here." 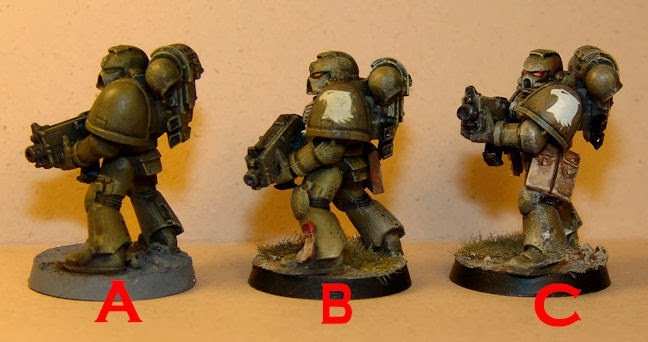 Sergeant Locus grumbled, taking the magazine out of his bolter to visually check his ammo. Captain Ickarius never looked up from the massive tome of memorabilia he held open for the Vanguard squad to see, though they only feined interest when he looked at them. "Well, call Dargo and his Stormwarbler." He said dismissively. "That should show those Chaos traitors! Now look here Centrorius, these here were some nasty traitors...." He flipped a few pages.... "Ah, Grabstov Minor, tentacles galore... wow! Look here, I have a sucker from one of the tentacles here on this page." Locus grimmaced inside his helmet then, looked out over the ruined city where the ORKS they were fighting were regrouping. "StormTalon 4, mark this location and assist." "Better say please!" The captain added, "The Stormmallard driver doesn't like it when you are rude." "Stormtalon,sir" one of the Vanguard corrected. "Right, right...Stormbudgie, that's what I said. Hey, there's a dead Ork over there. 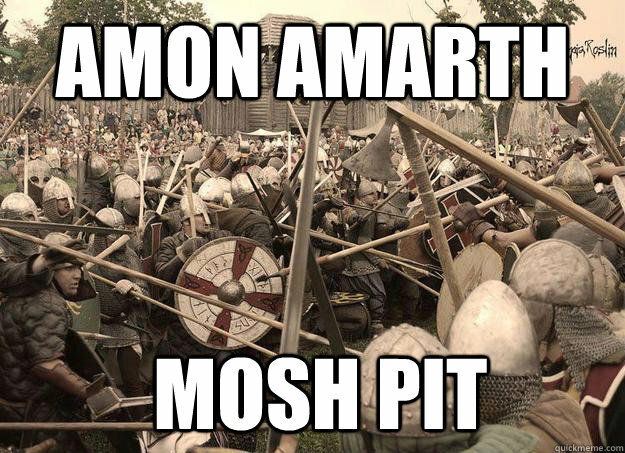 There are Orks here too?" It begins, as all aircraft should, with the cockpit. I added a few photo-etched brass parts that no one will likely be able to see to spruce things up and aid my inner aircraft geek. 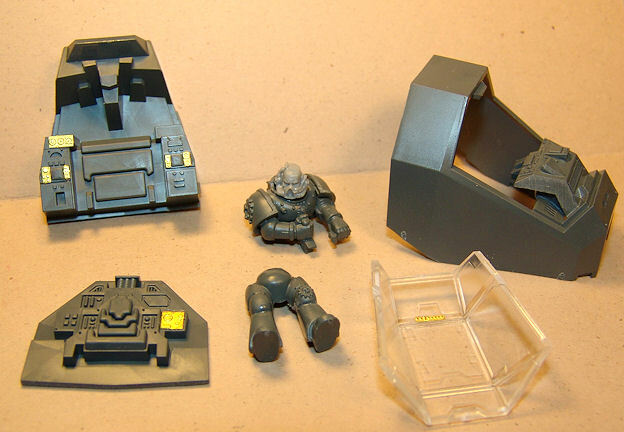 When the building was done, here are the sub-assemblies. Being an old aircraft model builder from way back - I used to judge and compete in IPMS/AMPS Model contests all through the '90's- I just couldn't help myself when I found a fitting problem. A gap at the back of the cockpit. First, I test fit the cockpit canopy with some wood glue and WHAM...there it was... HUGE gap...well, maybe not huge, like the width of a fingernail. But a bit of strip styrene and some filing later, great fit. 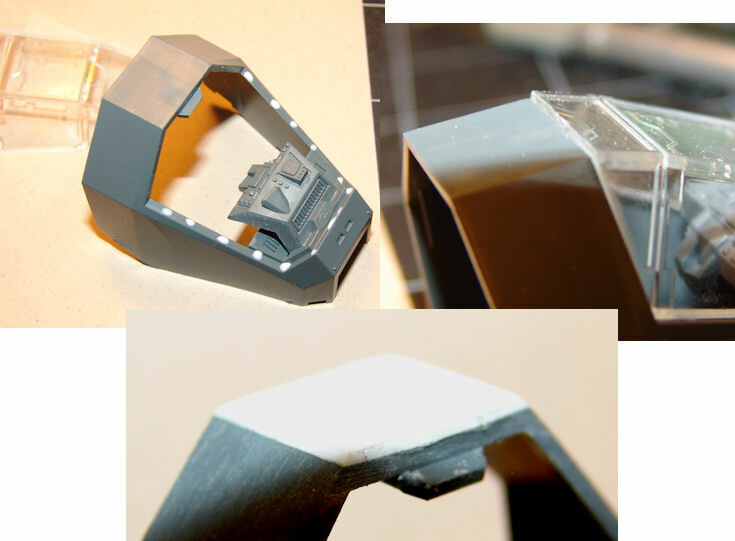 One bit of advice to any novice modelers...always,always,always test fit/dry fit your pieces together. Not only does it show if there are errors with the kit but it can give you ideas on things you might want to change,etc. Glue comes later. 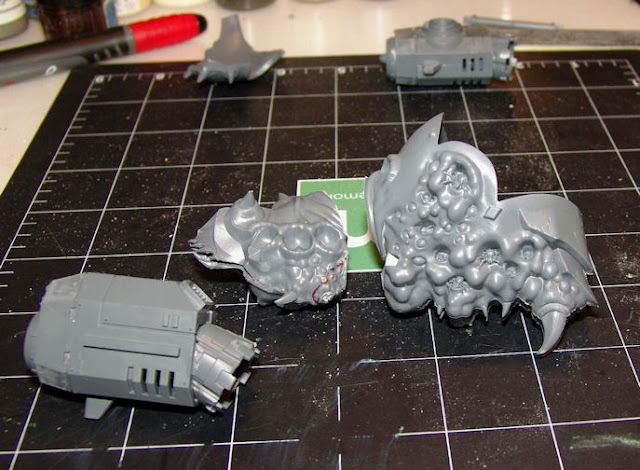 Also...superglue is for metal( or metal to plastic), do yourself a favor and buy some plastic model glue for your plastic models. Next on to painting. The "plan" was to do a step by step. How the Rednekkboss paints. I started out with good intentions...really, I did. Here's the first step. Undercoats. Dark Black-Brown for the mostly red pilot and Dark Grey for the cockpit. 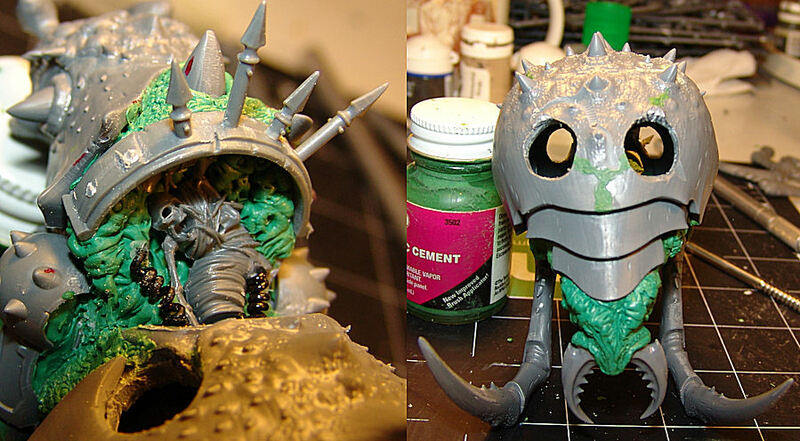 Then a bit of Lighter Grey mixed with Bleached Bone drybrushed to pick up all the raised details. After that is a light wash with a light brown. Here's where things went off the tracks..... To save time (or maybe it was sleep deprivation) I didn't use my little toilet paper filter over my flash and took quick pictures at each stage. Yup... not a one of them came out worth a damn. So, after a few color applicationas and a dozen washes or so later.... here's what I ended up with. He still needs a Raptor Icon on his shoulder, but otherwise he's ready to go. I named him Dargo, because he has a yellow nose (if you didn't get the reference, google "Farscape"). I slapped the cockpit components together for a test fit and sure enough, you won't see most of the stuff I just spent 4 hour painting... nothing new. But at least Dargo gets to spend some time in the Stormbudgie simulator until the fuselage is ready for the cockpit. ZOOoooooooom zooooom! Next post should be up @ Sunday. Cheers ya'll! I had guys with Missile launchers, but that was it for Heavy Weapons. I decided to sacrifice a couple of my powerfist wielding champions, since I had 4. SO.... its off for some redneck engineering. A couple Chaos Heavy Bolters and a bunch of assorted bits later, I came up with these Autocannon wielding bloaks. The newly dubbed, Ms Charlotte is in the process of being 'mated' to her flight stand. I intend on expanding her belly around the top of the flight stand .. one gruesome layer at a time. 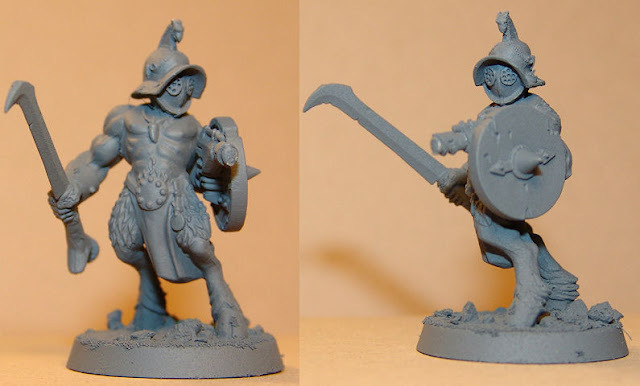 This fellow will be part of a herd (oop...I dropped a pun) of half-crazed or possibly full crazed, Khorne worshipping maniacs/meatshields that I'm putting together to run in front of my eventual squad (or squads) of Khorny marines. 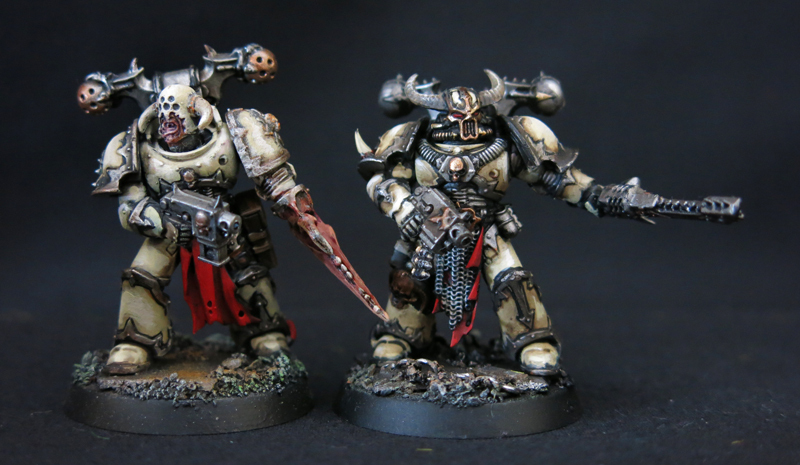 Because..... dieing is fun and Khorne really doesn't care where the skulls come from. Next up, We've got a little transport for the allies. 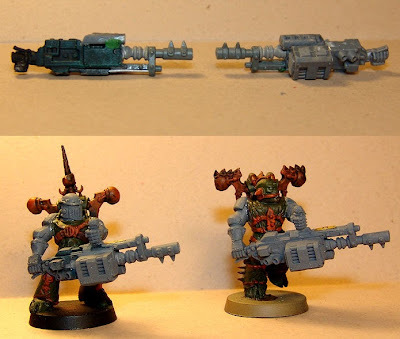 The ORK allies. Yeah, I was kind of all over the place. This Trukk is cobbed together, as any proppa Orky trukk should be, from left over resin wheels from a 1/35 scale Russian 8 wheeled APC, GW Ork Trukk parts, some old brass rod, greenstuff rivets, 1/48 scale photoetc aircraft parts Stock plastic and there will be a Forgeworld gun pit. 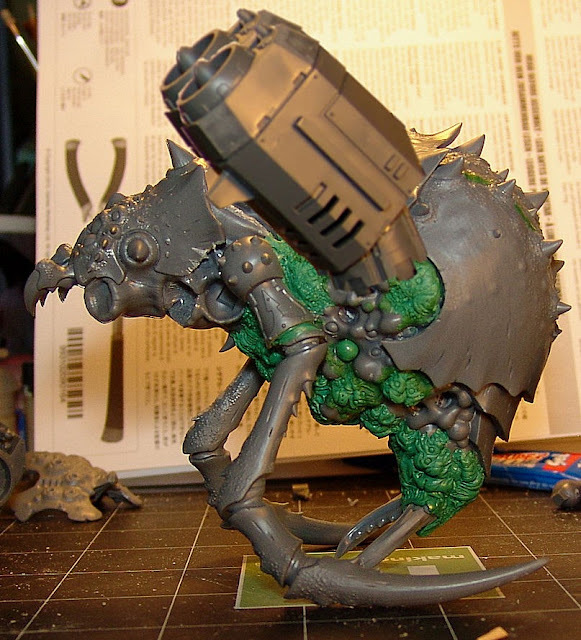 (....and I'm certain I missed something) Transport for Lugnutz' Lootin' Boyz. Who aren't actually Lootas... but don't tell them that, cause they really like lootin' stuff. Now, the BIG question....... Why have a Psyber-Eagle, when you can have a Psyber-Magpie? I ask myself that at least twice a day. Probably why I'm on regular meds...but,er....oh, I gave the man a the bird. NO,NO! not THAT bird...the other bird. 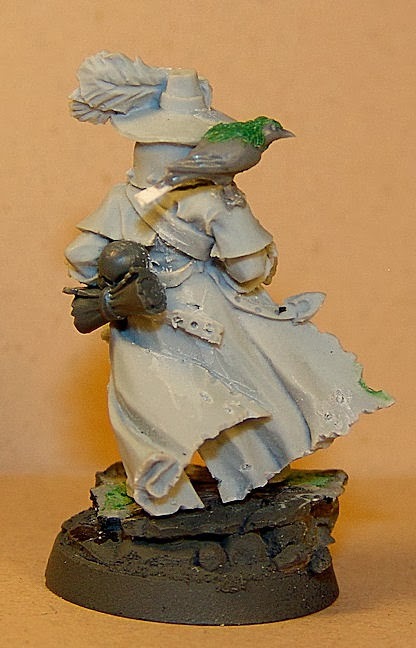 A little birdy from the GW Giant kit that's supposed to be a crow, I think, became the Psyber-Pie. I may still lengthen its tail,but otherwise, I'm pretty happy with it. I lopped off its head and reglued it with a bit of a turn, since the body sits at an angle. And yes...oh yes, his Lordship will have bird crap on his jacket. Because anyone who has owned a pet bird knows... they crap... a lot. 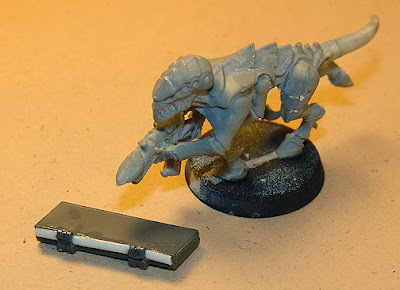 Otherwise, I'm still trying to figure out his Daemon hammer, whether It'll be slung across his back- or whether that'll make the miniature too "busy". I'm toying with some sort of creepy menial, Igor like thing to be carrying it. Besides the hammer...he is ready for paint. I love the new codex, for what its worth. I'm sure people will find their faults with it. You can never please everyone. You can definitely count me among the Chaos faithful that wishes their book had been put together in the same format (and wonders why the hell it wasn't.... but that's a whole other rant I'll likely NEVER get into here) Overall, its a beautiful book, physically, and the price is what I would probably pay for a history book of the same size, so I for one won't complain. My wallet will be hurting with the emminent release schedule since the rumors all point to Orks, Imperial guard and Tyranids all in the not too distant future.. as well as Space Wolves, which may yet be where my extra marines end up going. Who knows. When your brain has been exposed to the Warp as long as mine has things can change. ONE LAST THING.... the wife has christened the Spider-drake, fittingly, Charlotte. Since she deserves some respect, she shall be known as Ms. Charlotte and will get the next post ALLLLL to herself since ether have been some interesting developments. Look for that around Sunday night. Time for some SHAMELESS PLUGGING! To loot a line from The Python crew "And now for something completely different..."
NOW, LOOK 'ERE YA LUGGZ! "Hmmmm, I'll bet she looks great NEKKID..." "It IS remarkable you are STILL alive, Jim"
For those METAL HEADS in the crowd, I have an up and coming local band I want to plug. If you like your music hard and masterful and your vocals that sound like they are coming through a portal from hell, give these guys a listen. They are a young band with TONS of potential, who have been opening for national acts locally. GUVERRA ! I have finished the thorax cockpit/torture chamber/sacrificial pit/very uncomfortable place to spend eternity. Well, finished as far as I can before painting it, that is. WHAT!?!? Yeah... I said it. Before the next stage can move forward with that area (with exception of the wing mounting)... I have to paint it. Then there's this guy. He's been keeping me busy while waiting for putty to dry. No one ever expects the Inquisition. He's destined to be standing in for Inquisitor Coteaz in my not-so-Grey Grey Knights force...or as I like to call it, my Crusade Army. I'll be using my Sisters of Battle minis as Inquisitorial Henchmen and all other kind of wierd things are bound to happen. I'm just hoping when I pick up my new Space Marine Codex in a couple days it doesn't give me too many crazy ideas, because I know I have enough unbuilt marines to start another army. I know. 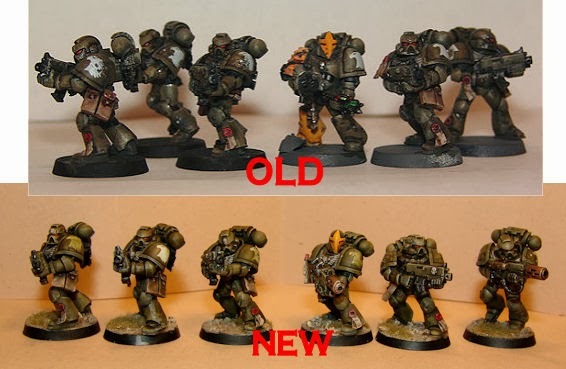 I know.... but its nice to hope that I won't end up buying a ton of new marines. Especially with the Hive Fleets on the horizon. More progress on the Spider-drake. I got to thinking, "What or who might be piloting this thing?" I kind of wracked my brain on how to fill the big empty space in the thorax. As luck would have it (or maybe it was Tzeentch, but we don't like to think about that) the Arachnorok Spider was highlighted in White Dwarf this month and it had inset photos of all the neat little dead things on the goblin sprue I basically hadn't even looked at. Thus... I found my sacrifice...er, pilot. OH... and, in case you were wondering, I'll be scratch building some wings. Mechanical wasp-like wings, she is a hunter after all. .... or a spider like thing...and I put jet engines on it! 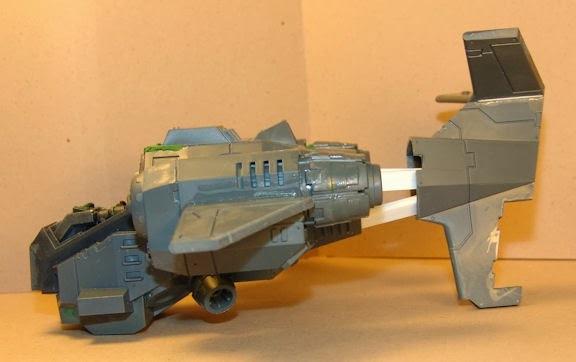 The engines from a Stormtalon with inverted nozzels, which I figure can swivel a bit. The basic body of the Arachnorok Spider, chopped in half. I figured out the right 'attitude' I want in the body and went after it with the dremel. Believe it or not, I even wore my safety glasses. 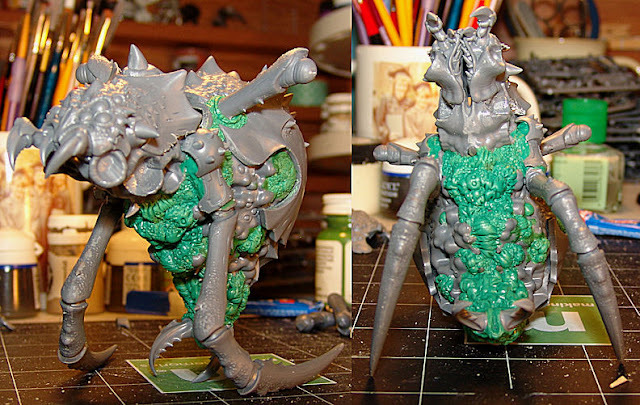 With the body parts pinned together, the sculpting, gross-ifying and chaos-ifying begins. The central body will be highly mechanized and I'll be adding pipes, hoses and wires to the engine supports. Plus I'll be chaos-ifying the engine nacelles a bit, to make them a little less Storm Talon-y. 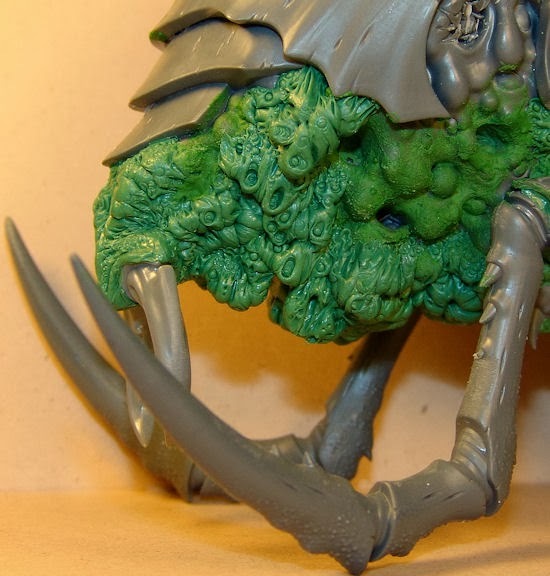 More legs, gribbly bits and more gross stuff to come. 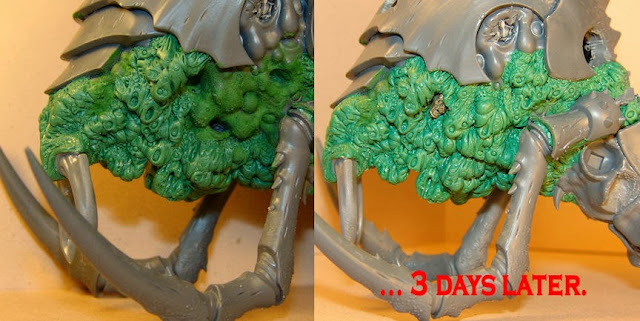 But for now, I'll be letting the green stuff sit overnight, at least.